What are the colored belts achievable through your traditional program? There are nine colored belts (Kyus) and ten degrees of black belt level (Dans) at Kick Masters. Testing usually takes place in 3-month increments at the beginning and intermediate levels, and at 6-month increments at advanced red and brown belt levels. The order of our belt system is white, gold, orange, green, purple, blue, red, 2nd kyu brown, 1st kyu brown, and then black belt level. It takes approximately 3 ½ years to achieve a black belt at Kick Masters Karate. I heard that grades are a big part of becoming a black belt at Kick Masters, is that true? Grades are extremely important in our program, and they should be promoted at any quality studio. In fact, 95% of our junior black belts are straight-A students, and over 80% of our under belt student population are honor-role students. Kick Masters has several academic programs to improve, encourage, promote, and reward great grades. 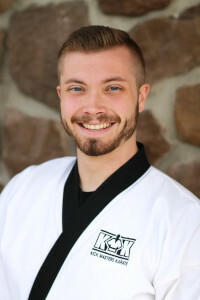 They include the bi-yearly Super Grade Pizza Party for exceptional grades, our academic achievement patch for straight-A student for the entire school year, and the Kick Masters Karate Black Belt Scholarship for high school seniors. I’m an adult and I haven’t done much physical activity for a while, am I going to able to keep up? Yes! 90% of sticking with an exercise program is mental. Just by asking the question, you’re almost there! We have a fantastic system set up for introducing beginners into our teen/adult class, regardless of their current physical condition. Included in our state-of-the-art, 8,000 square foot facility is a private training room. All first time teen/adult students take their first few classes 1-on-1, in the comfort of a more secluded training setting. After a beginner feels comfortable enough to join the rest of the class, they are encouraged to participate in the group warm-up, after which time they are split again into their smaller rank group. You’ll be able to keep up, because karate is an individual sport and each participant moves forward at their own speed! When do you begin sparring in your program? Sparring or “kumite” is not done until orange belt level, or 9-months into the Kick Masters program. Students, dressed in full safety gear, participate in one-on-one timed matches for points in matted floor rings. Required foam dipped protective gear includes hand and footgear, shin pads, mouthpiece, headgear, and groin cup. Some students even add extra safety gear as they wear chest protectors, elbow and/or kneepads, and face shields. After one and two-step drills are established, students spar with junior or adult black belts first, as they exhibit the most control while adding positive feedback in developing skill. If the student demonstrates the ability to control his/her attacks and counter-attacks, highly structured matches between individual students of the same rank or higher then follows. At Kick Masters, sparring is quite fun and safe for younger students, and very challenging, yet non-confrontational for teens/adults. At Kick Masters, weaponry is not taught consistently until purple belt level. Weapon classes are usually forty minutes in length, as instructors teach fundamental blocks, strikes, and movements with each weapon so students can better understand basic handling and central concepts. The history and application of each weapon is established first, before any student is taught the basics. Many students better themselves in weaponry by attending private lesson sessions, or by attending the weaponry specialty program. Weaponry is not required until black belt level and we teach both traditional and modern weapon application. I want to break boards, when do I get to do that? In order to break boards at Kick Masters, students must be 18 years old or older, or, be 15 with parental consent. Boards are 1-inch thick pine shelving wood, cut to the dimensions of 9 x 11½. Adult breaking does not take place until green belt level, or 1 year into the Kick Masters’ program. Board breaking requires students to demonstrate focus, technique, speed, follow-through, and confidence. It’s done in a controlled and safe environment, with proper black belt supervision. Board breaking itself measures the quality and power of any given technique and is quite exhilarating to watch. Is it ok that we watch our child participate? One word: absolutely! We encourage all parents/guardians to participate in their child’s training, be it as an observer/coach or as a participant themselves. When you take an active part in your family’s cognitive and physical development only positive things can happen. Whether it’s explaining the “Life Words” in the Little Dragons Program, reinforcing the “Mat Chats” in the Mainstream Program, or implementing the Quote of the Week and Weekly Health Fact in the Teen/Adult Class, onlookers can emphasize the values and character traits promoted by the Kick Masters staff. Does bowing have anything type of religious reference? No. In general, the martial arts is very “military like” with its commands and structure. Within the armed forces, participants are taught to respect those of a higher rank by saluting and saying “yes sir” and “no ma’am”. Respect is what karate teaches its students on a daily basis through specific actions and verbal responses. More specifically, bowing is one of the main ways to show respect at Kick Masters, other than saying “yes sir” and “no ma’am”. Bowing can be compared to a handshake, and is done when entering and leaving the studio, when beginning or ending a class, and/or at the end of an exercise. My child is 6 1/2 and we're not sure which program to enter. What are the biggest differences between Little Dragons and Mainstream Karate? Great question! 1) Classes meet more frequently (2 traditional classes and 1 children’s self-defense class per week - the self-defense class is optional). 2) The mainstream program is more performance based (advancement in the mainstream program is based upon knowing and demonstrating a specific set of curriculum at each belt level). 3) Memorization is required (terminology and basic history are taught to encourage a cognitive approach as opposed to just the physical). 4) Practice is standard (practicing at home is necessary for success in the mainstream program - i.e. 15 minutes a day). 5) Games and drills are more substantive (don’t worry, we still have tons of games we play throughout the mainstream program, they’re just more age appropriate). Our best advice, try out a Little Dragons Class first to see if it's too easy for your child. You can always move to a more challenging class at any time! What’s the difference between a junior and adult black belt? Very few differences separate a junior from an adult black belt. The biggest distinction between these two ranks is board breaking. Junior black belts have completed all the other requirements necessary for achieving the rank of black belt, but due to their age (i.e. body development), are not allow to break boards. Another difference is responsibility and maturity. Qualified adult instructors, under the supervision of senior leadership, run and facilitate each and every class. Juniors are present to assist the adult instructors, but most importantly attend class to set stellar examples for fellow students in the form of skill, respect, detail, discipline, and attentiveness.